Once they were considered counterculturalists--now they are the forerunners of the American herbal renaissance! 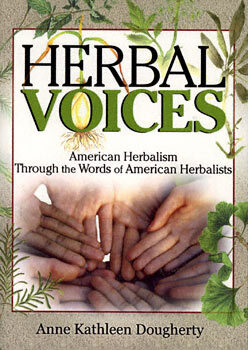 In Herbal Voices: American Herbalism Through the Words of American Herbalists, the herbal community rooted in the 1960s and 1970s counterculture reflects upon the mainstream fascination with herbal medicine in the twenty-first century. Through interviews with twenty leading herbalists from across the country, this book explores the roles of science and folklore in modern American herbalism, the ups and downs of professionalism in the field, the endangered plant crisis, and spirituality in herbal healing. This rich resource fills a gap in the existing literature for herbalists, herbal enthusiasts, historians, anthropologists, popular culturists, and holistic/alternative medicine. "Excellent....an invaluable reference for anyone interested in biomedicine, herbalism, and the healing arts. I was deeply moved by the intent and commitment of both the herbalists being interviewed and the author. Dougherty winds her research, her discoveries, and the heart of each interview around her own dreams and hopes for herbalism's potential as a healing force on the planet." "I heartily recommend this book. It may become a class in the sociology of herbalism...Anne Kathleen Dougherty has written a remarkably readable account of herbalism in America. Her distinctions among types of herbalists are illuminating and dialogue-generating. Her discussion of the economics of herbalism and its place in a capitalistic society is also very insightful. She nicely reviews the ethics of wildcrafting and of harvesting herbs and discusses options for long-term sustainability of herb production."